Morningstar recently updated its list of Global Equity Best Ideas and among the new additions we find three ASX-listed names; Telstra ((TLS)), Aveo Group ((AOG)) and Crown Resorts ((CWN)). Given the share price history for each of these three, we do not have to double check for the reasons behind their inclusion. Hint: it's share price weakness related. There were no Australian names among those who have been removed, which means the three newcomers join Domino's Pizza ((DMP)), Coca-Cola Amatil ((CCL)), Santos ((STO)), QBE Insurance ((QBE)), CommBank ((CBA)), Healthscope ((HSO)), Ramsay Health Care ((RHC)), Brambles ((BXB)) and Westfield ((WFD)) to make for a total of twelve stocks that have been put to clients across the world to consider buying, in case of any need to put money to work in Australia. The same twelve stock ideas have been communicated to Australian investors through the weekly report that once upon a time was widely referred to as "Huntleys", but nowadays is titled Your Money Weekly, Issue 42. Strategists at UBS remain of the view that Australian equities should be able to deliver a total return of 8-10% in 2018, even though their end-of-calendar-year 2017 target for the ASX200 remains at 5875, below where the index is trading at in the second week of November. Broadly taken, the strategists remain overweight both resources and banks and with investors pushing up share prices across other sectors, UBS strategists has the focus out for growth at a reasonable price (GARP). This month's new model portfolio inclusions are Independence Group ((IGO)), Link Administration ((LNK)) and QBE Insurance ((QBE)) while all of BlueScope Steel ((BSL)), Boral ((BLD)), Incitec Pivot ((IPL)), James Hardie ((JHX)) and Sims Metal Management ((SGM)) have been removed. Juicy detail: the removal of these five stocks occurred because the responsible analysts left the firm and there's no coverage until a new analyst enters the frame. Emerging companies specialists at Ord Minett have seen no reason to change their Top Pick and Bottom Pick this month. Salmon producer Huon Aquaculture ((HUO)) remains Top Pick with the broker's forecasts sitting well above market consensus, while Collection House ((CLH)) is still seen as the stock to avoid. MSCI is scheduled to update investors about any changes to the composition of its widely followed indices. Analysts at Wilson do not think there will be any changes for the MSCI Australia index, but there should be plenty for the MSCI Small Cap index. Most likely to be included, on Wilson's assessment, are Soul Pattinson ((SOL)), Afterpay Touch ((APT)), Lynas ((LYC)), Bingo Industries ((BIN)), Servcorp ((SRV)), Blue Sky Alternative Investments ((BLA)), CleanTeq ((CLQ)), Ausdrill ((ASL)), BWX ltd ((BWX)) and RCR Tomlinson ((RCR)). About to be booted out, according to Wilson, are Cabcharge ((CAB)), Liquified Natural Gas ltd ((LNG)), Vita Group ((VTG)), Catapult Group ((CAT)), Karoon Gas ((KAR)), OzForex ((OFX)) and Energy World Corp ((EWC)). Wilsons also adds a few possible inclusions at lower conviction: Collins Foods ((CKF)) and Appen ((APX)). Lower conviction candidates for removal include Select Harvests ((SHV)), Donaco International ((DNA)) and RCG corp ((RCG)). Preferred trading strategies are to position "long" Afterpay Touch, Blue Sky and Washington H Soul Pattinson while being "short" Energy World Corp. Strategists at Deutsche Bank have used an analysis on high and low Price-Earnings (PE) stocks in the Australian share market to highlight their preference for Stockland ((SGP) and Harvey Norman ((HVN)), as well as for AGL Energy ((AGL)) and Suncorp ((SUN)). Costa Group ((CGC)) has now been removed from Goldman Sachs' Australia/NZ Conviction Buy list, which should come as no surprise given the fierce and relentless share price rally that has preceded. Goldman Sachs cut its rating to Neutral from Buy, as its twelve month target of $6 is now well below where the share price is trading. Meanwhile, TechnologyOne ((TNE)) has been announcing no less than ten new major deals to the stock exchange recently. On the company's own assessment, it is winning more than 90% of all new contracts from local governments. So much for any impact from the Brisbane debacle. Bell Potter analyst Chris Savage, one of few who has a day job of covering the local tech sector, has responded by lifting his price target to $6 (up 50c) on what he describes as "rising confidence" that the company's misfortunes in FY17 will prove to be of a one-off nature. TechnologyOne's share price has swiftly recovered from the initial sell-down response, but remains doubld digit percentage below Bell Potter's new target. Last week I reported stockbroker Morgans had added Link Administration ((LNK)) to its High Conviction List. It has since emerged that move coincided with the removal of data centres operator NextDC ((NXT)). The latter move is explained as a profit taking exercise. "We retain a positive view on the outlook for the stock and keep it on the watchlist for future re-inclusion". Including these two changes, the High Conviction List now consists of ResMed ((RMD)), Link Administration, Westpac ((WBC)), Oil Search ((OSH)), Motorcycle Holdings ((MTO)), Aventus Retail Fund ((AVN)), Bapcor ((BAP)) and PWR Holdings ((PWH)). With a rare exception, Weekly Insights has been updating on analysts conviction calls since early February this year. Paid subscribers can re-read past editions via the Rudi's Views section on the FNArena website. Recently, RBA board member Harper opened up the possibility the Reserve Bank could still consider cutting rates in response to entrenched weakness in consumer spending. That said, at the time, Harper did not think that consumption would remain weak, and as such, was merely highlighting a scenario rather than base case, pointed out economists at Credit Suisse this week. Now that we've seen the release of yet another underwhelming update on retail sales in Australia, should we switch our attention towards the scenario suggested by Harper? Credit Suisse, still predicting two more rate cuts (not hikes) in 2018, suggests others inside the RBA would be paying attention given the overall importance of consumer spending. 1. Anaemic nominal wage growth. 2. A sharp increase in the basic cost of living (e.g. utilities). 3. Ongoing debt servicing issues from over-indebtedness. This new indicator forms one of the cornerstone arguments behind Credit Suisse's house view as to why the RBA may not be done yet with cutting its cash rate, even if it wants to. Investors should note Australian bonds are now pricing in a full 25bp extra by May 2019, from December 2018 prior. 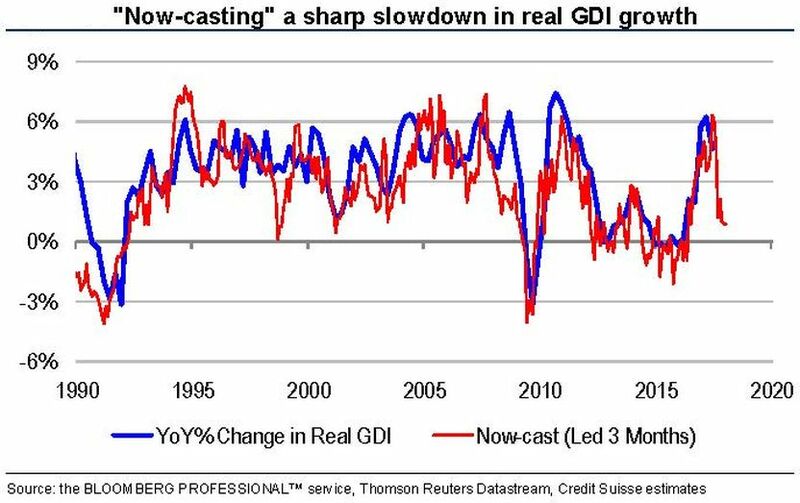 Not that this cannot change quickly if the facts change, but that sound you are all hearing in the background is the ducking of economists underneath their desks who previously were all too eager to predict the start of a new, steep hiking cycle soon. Last week I reported there was one final ticket still available for An Evening With Rudi in Paddington on November 22. That ticket has now been sold. Truly looking forward to sharing my latest insights, alongside various genuinely revealing tables and price charts, big trends and personal observations. But first I will travel to Adelaide to share all of it with local members of Australian Investors' Association, and guests. Next week (Nov 13-17) I am visiting Adelaide to present to the local chapter of the Australian Investors' Association (AIA) on Tuesday. As I will be traveling on Monday, there shall be no Weekly Insights for the week. No doubt, I will have plenty to write about the following Monday. My presentation in Adelaide is the final event locally for the running calendar year, and as such there will be bickies and drinks afterwards. If you are a regular reader or paid subscriber attending the event, please say hello whenever the opportunity arises. My ear is always available for both praise and for constructive criticism. This year's newly launched website is an eternal work in progress. All ideas are welcome. I intend to take an overdue break in December, thus the number of Weekly Insights this year post this week will be limited to a maximum of three. It was quite the exceptional year, 2016, and I did grab the opportunity to write down my observations and offer investors today the opportunity to look back, relive the moments and draw some hard conclusions about investing in the world today. 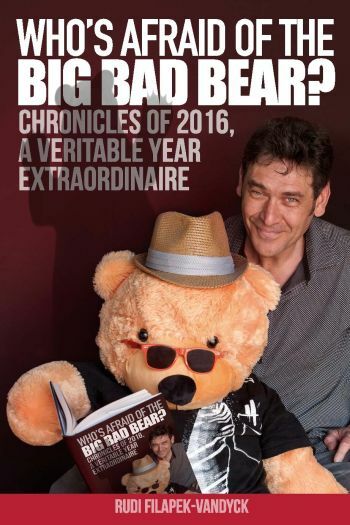 If you are a paid subscriber to FNArena, and you still haven't downloaded your copy, all you have to do is visit the website, look up "Special Reports" and download your very own copy of "Who's Afraid Of The Big Bad Bear. Chronicles of 2016, A Veritable Year Extraordinaire" (in PDF). For all others who still haven't been convinced, eBook copies are for sale on Amazon and many other online channels. You'll have to visit a foreign Amazon website to also find the print book version. (This story was written on Monday 6th November, 2017. The first part was published on the day in the form of an email to paying subscribers at FNArena, and again on the following Wednesday as a story on the website. This is part two). Is This The Melt Up? Rudi’s View: Resources Stocks: What’s The Problem?